Don Roberts from Bears Custom Shop outdid himself on the magazine cover car, many award winning Bob Dofflow 1949 Ford Sedan. Lets take a closer look at this beauty. ‪Bob Dofflow‬ 1949 Ford Shoebox restyled by Don Roberts at his Bear’s Custom Body Shop in Downey, California in the early to mid 1950’s is one of the most attractive restyled Customs of its kind. The Custom was designed to flow together from front to back. Every design element that was added was carefully placed, and repeated in shape where needed. The way the grille teeth are echoed in the above the headlights scoops, the way the flow of the chopped roof was repeated in the teardrop shaped wheel openings. 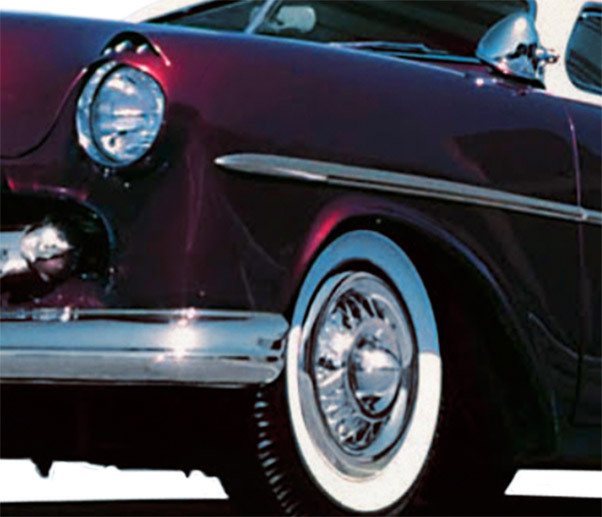 The lip from the 1951 Ford front bumper is repeated at the back with the use of an 1954 Ford front bumper. It is all these, and many more details that make the Bob Dofflow 1949 Ford one of the very best Custom Shoebox Fords ever created. Bob Dofflow’s son from Yucaipa, CA mentioned that the Custom Restyling on Bob’s Ford was started around 1950-51, some time after his father had bought the car new. Despite his mothers protest, Bob asked good friend Don Robert’s who ran the Bear’s Custom Body Shop next door to the Dufflow’s if he could do the work he had been dreaming about for years. 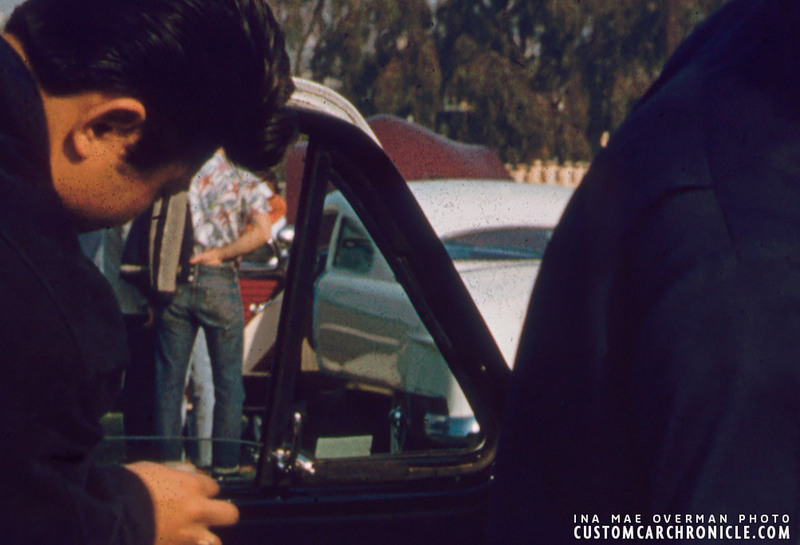 Bob was still a young guy, but had been into customizing for many years and had studied every custom he had seen, so he knew pretty good what he wanted. The use of the 1954 Ford front bumper with it heavy overhang on the back is brilliant. It gives the car extra lenght, plus it has a similar peek at the bottom half as the 1951 Ford bumper used on the front. This low angle photo shows how beautiful the lines of the chopped and shaved top looks, and how well the teardrop shaped wheel openings match the flow of the top. Round trunk corners match those of the cars hood. Dead-on front show shows how well all the elements work together on Bobs Ford. The repeating grille teeth above the headlights, the perfectly rounded hood corners matching the shape of the mercury grille opening. The car would be in the works off and on, as money and time allowed the work, for over a year and a half. During this period the latest parts were used to update the car. The work started with lowering the suspension with cut coils in the front and lowering blocks in the rear. Next was the chop, Bob wanted a heavy chop, so Don took around 4.5 inches (according the magazine articles) out of the top and did a lot of work to reshape the rear portion of the top and quarter windows to get the right flowing lines. In the process the drip rail was shaved, which was the common practice in the early 1950’s in SoCal. 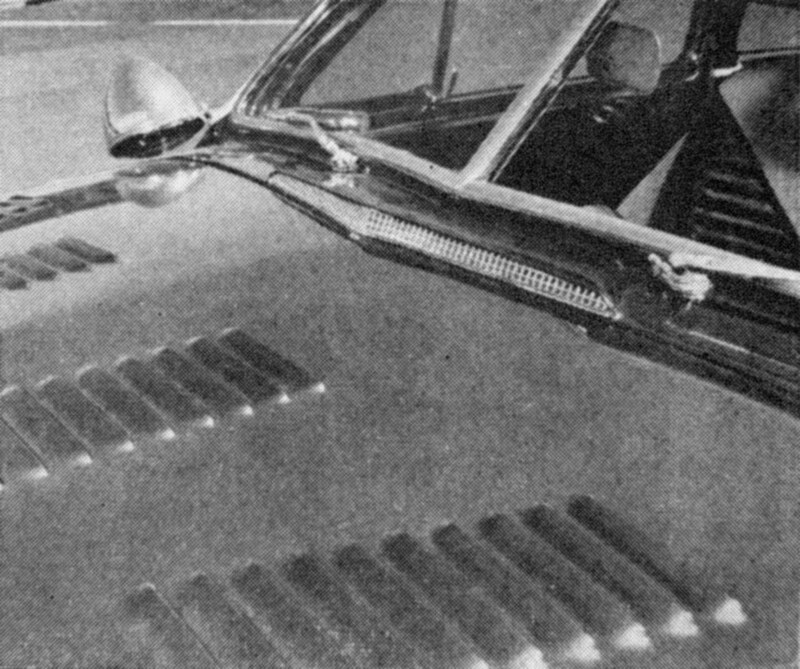 At the front Don Roberts molded a ’49-50 Mercury grille shell in place, rounded the hood corners, and smoothed the shaved hood before punching in 4 rows of louvers, which was kind of unusual for Customs. The headlights were frenched, possibly ’52 Ford units, with small eye-lids added to the top portion. Above the headlights small air scoops were created and later dressed up with three small chrome or stainless teeth. The door handles were shaved, and all chrome side trim and trunk hardware shaved and body worked till perfection. The stock taillights were modified and frenched into the openings a little. Stock ’49 Ford engine was dressed up with a lot of chromed parts on the original version. Closer look at the Headlights with toothed scoops, the teardrop shaped ’54 Olds wheel openings, and the Ford Accessory wire wheel hubcaps with ’51 Ford grille spinner bullets. Bob Dofflow standing and Don Robert kneeling in front of the Shoebox. Notice how the grille teeth are repeat above the headlights inside the custom scoops. 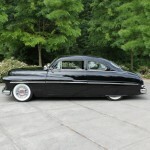 The same for the bullet shaped Mercury bumper guards, and ’51 Ford grille bullets. All corners, including the doors and trunk were rounded to give the car an even more pleasing look. And one of the nicest modifications done to help to smooth out, and streamline the car was the use of 1954 Oldsmobile 98 wheel openings front and rear.. 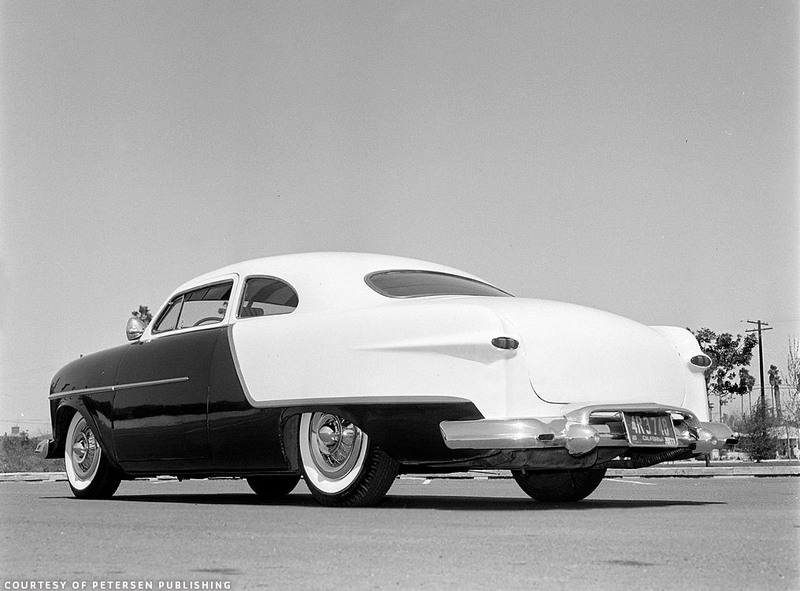 The Oldsmobile openings have a very nice teardrop shape which accentuate the shape of the chopped roof perfectly. Unique for this period was the choice to not use fender skirts on the rear. But then, who wants to hide those beautiful teardrop shaped rear wheel openings. The stock side trim was replaced by that of the 1954 Oldsmobile 98 that also had offered its wheel openings. The side trim and down the belt-line was used to separate the deep Titian Red on the bottom, and Alpine white on the top portion. According the magazine features 20 coats of lacquer paint were needed to get the right hue, depth and gloss. 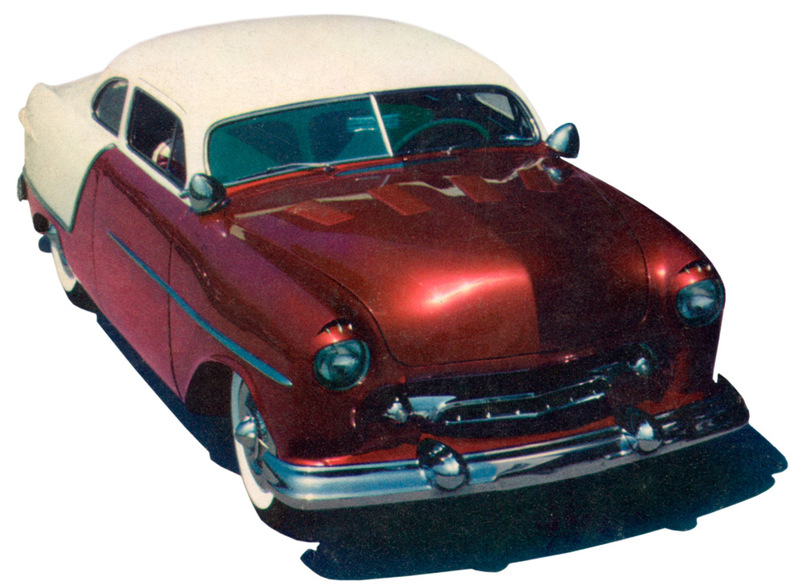 Don Roberts created a new grille bar to float inside the Mercury opening using an narrowed 1954 Ford grille bar. At both sides he mounted a 1951 Ford grille spinner bullet. The bullet was modified with the tip cut off and an 1951 Ford round parking light lens was modified to fit the tip of the bullets. One of the better looking custom created grilles of the era. The smooth ’49 Ford front bumper was replaced with an 1951 Ford units, which is the same in shape, but has an aditional peek added to make it fit with the grille really well. The bumper guards were removed and replaced with 1953 Mercury bumper bullets modified to fit the Ford bumper. The splash pan was molded to the front fenders. Unique for a Custom are the four rows of louvers punched into the hood. The addition of the cowl vent is another unique touch Don and Bob added to the car. Bill Gaylord did the totally unique diagonal tuck&Roll patter in maroon and white Naugahyde. The headliner had a front to rear pattern, with 3 rows of Tuck&Roll strips in the center portion. The garnish moldings were beautiful finished after the chop and chrome plated. At the back Don modified an 1954 front bumper (which has more of an overhang than the rear bumper) to fit the car. He modified a 1953 Kaiser bullet bumper guard to fit the Ford bumper, and added oval shaped exhaust tips to the bumper tips. The ’54 Ford bumper has a similar lip at the lower edge than the ’51 Ford bumper. It is details like this, that keep a theme going all around the car. 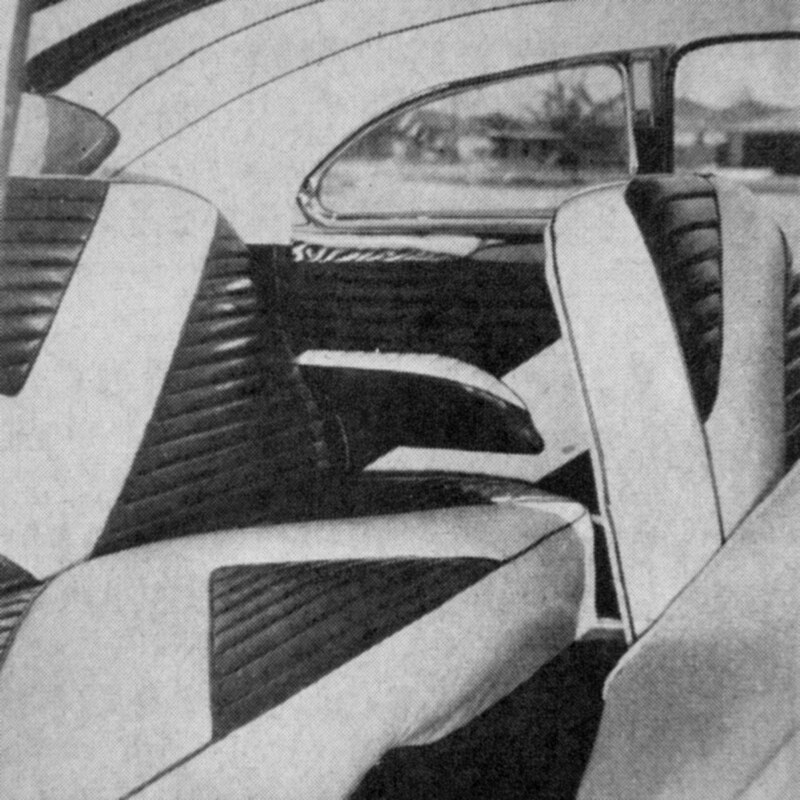 The interior of the car was done by Bill Gaylord. Bill lowered the front seat 3 inches to make sure the was plenty of headroom after the chop. He used maroon and whit Naugahyde in a diagonal tuck&roll pattern on the seats and door panels. The headliner was done with the same colors with a front to rear pattern, to create some optical length in the interior. The floor mats were done in dark Maroon with white piping and accents. The dash was painted Titian Red, and the window garnish were chrome plated. 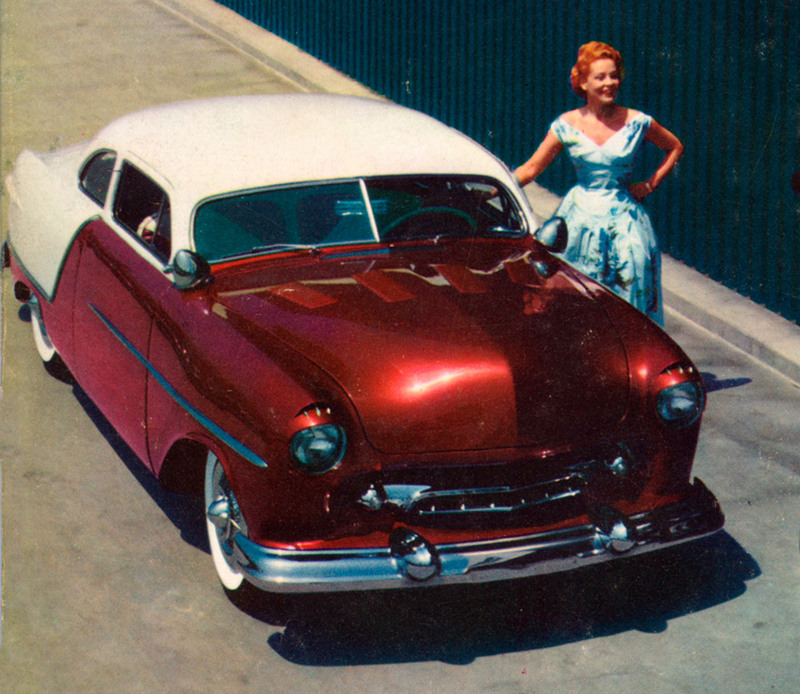 Beautiful Color photo from the 1956 Custom Cars Annual. The photo was taken by Peter Gowland with model singer Carol Richards. This color cover photo showed the real beauty of the car and must have left a lot of readers in total awe. 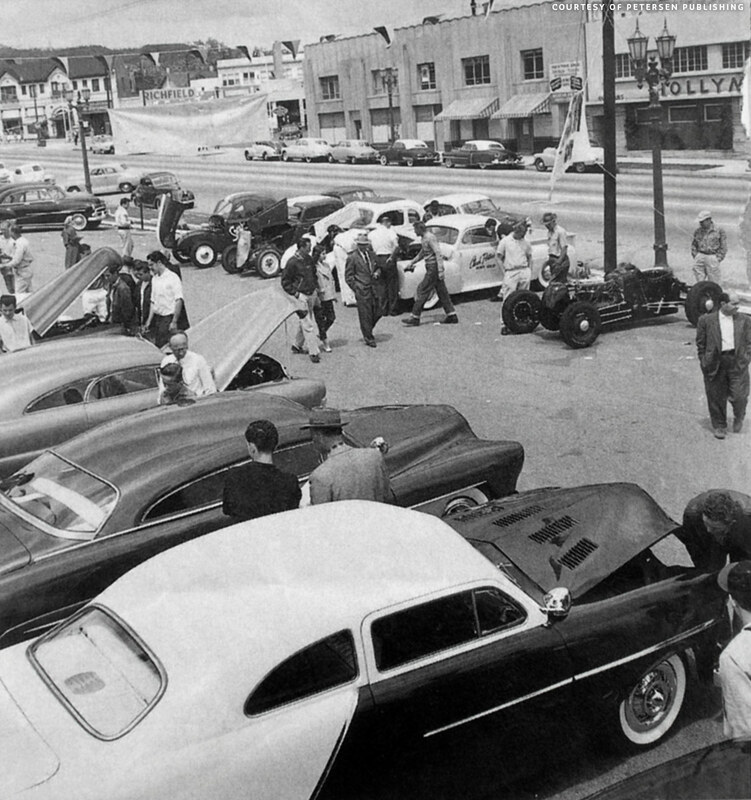 One day promotional Car Show at a Thrifty Drug store in May 1955 showing Bob Dofflow’s ’49 Ford together with Dave Bugarin’s 1951 Mercury and the Hirohata Mercury. Bob Dofflow next to Bob Hirohata with his Hirohata Merc, both winning an award at this outdoor car show. This photo was taken in 1955, after the Hirohata mercury had been painted lime gold. 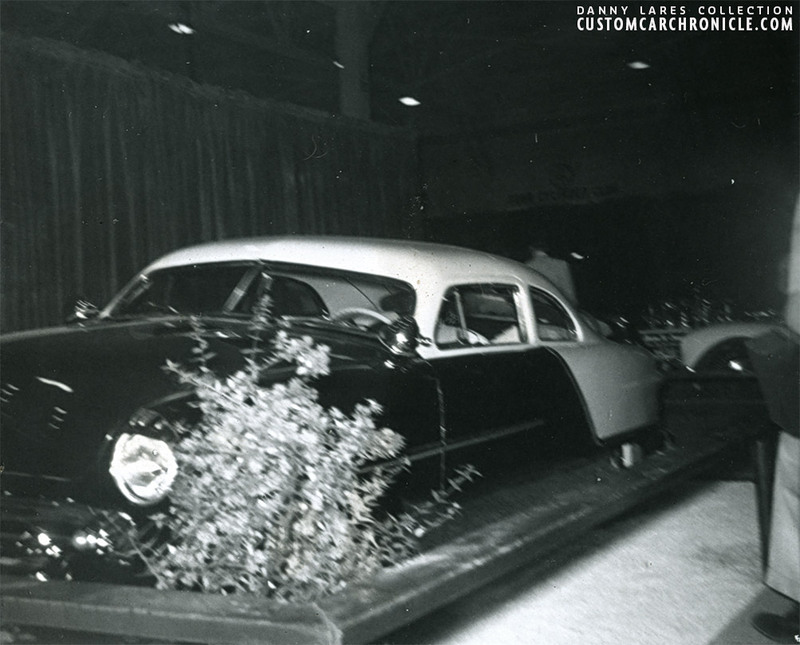 A small portion of Bob’s Ford can bee seen all the way in the back at a photo Ina May Overman took at the November 1954 Petersen Motor Review Autorama show at the Pan Pacific Auditorium. 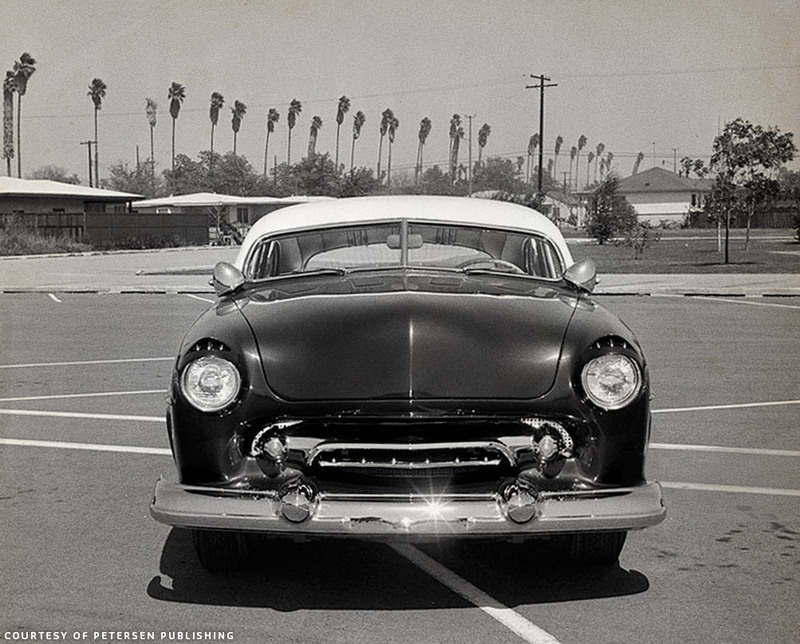 This snapshot of Bob’s Ford was taken by Danny Lares at the 1954 Petersen Motor Review. 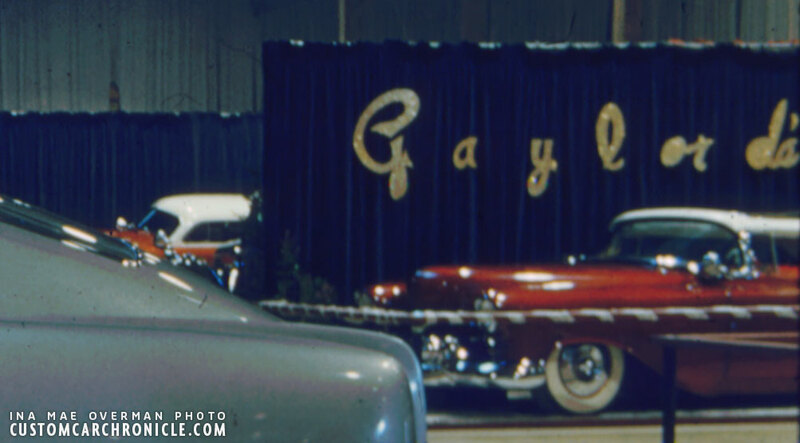 I spotted Don’s Ford in the back round of one of Ina Mae Overman’s 1954-55 outdoor car show. It does not show very much, but since it does show a bit of the interior in color, I wanted to included it here anyway. 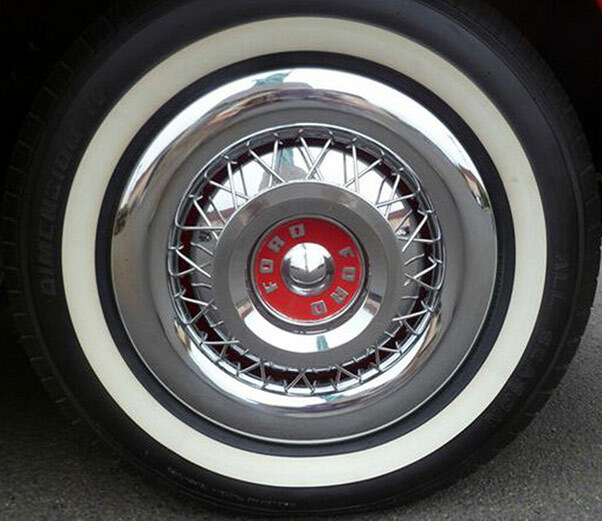 Finishing touches were a set of, for the time, mandatory Appleton Spotlights, wide whites, and a set of unusual for this type of custom, dummy accessory wire wheel hubcaps. But to make the unusual hubcaps fit the car four 1951 Ford grille spinner bullets were modified to fit the hubcap centers, and since the car does not use fender skirts, found units had to be made. By the time the car was finished Bob had moved to Whittier, Ca and he took the car to many Custom Car shows, but indoor as outdoor. And wherever the car was shown it won prices. Not strange since Bob’s Bear’s Custom Body Shop restyled 1949 Ford is one of the nicest of its kind. 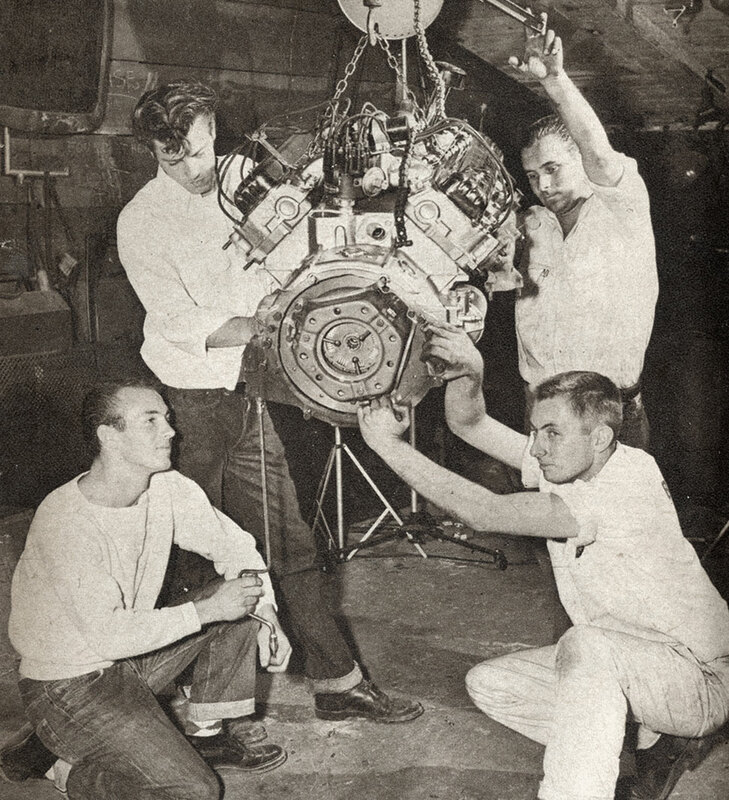 In late 1955 Bob decided the old dressed up Flathead engine needed to go, and he, and Don Roberts and team at the bear’s Custom Shop installed an 1953 Oldsmobile Rocket engine. 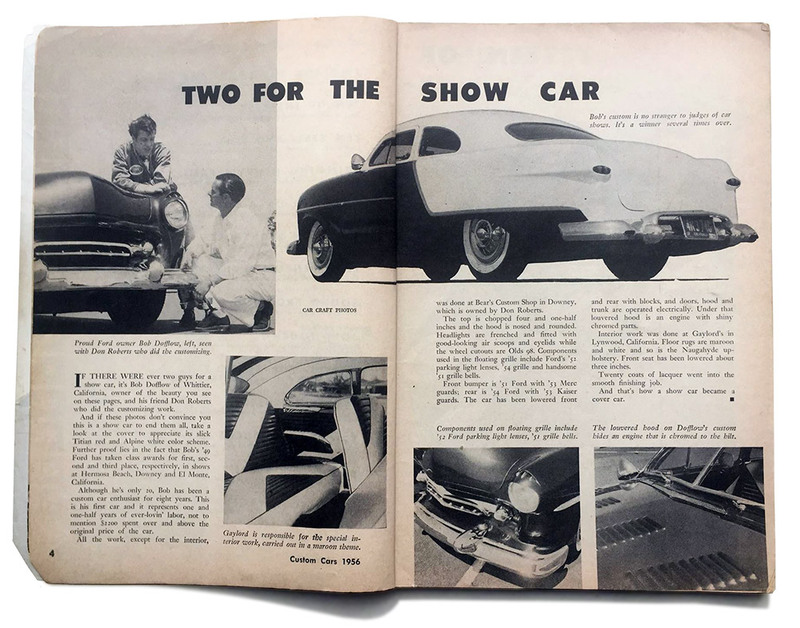 The installation was covered in a four page article in the February 1956 issue of Car Craft Magazine. 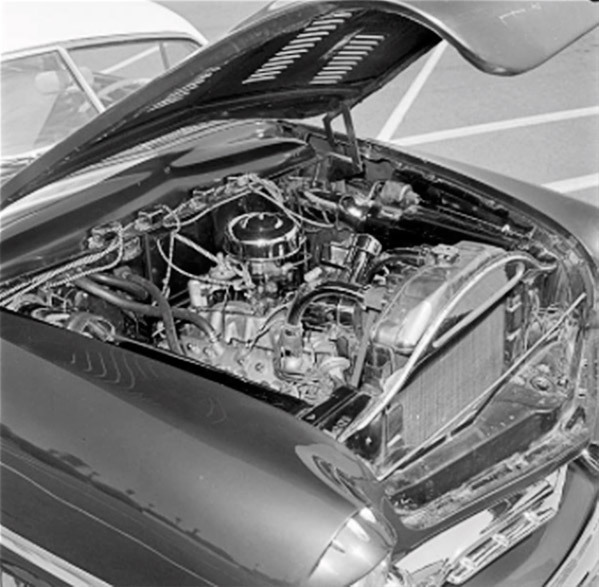 The Oldsmobile Rocket engine is dropped into the engine bay on Don’s Ford. Car Craft cover photo. This low angle photo gives a very good look at the beautiful front end design of the car, as well as the flowing shape of the 1954 Oldsmobile wheel openings. 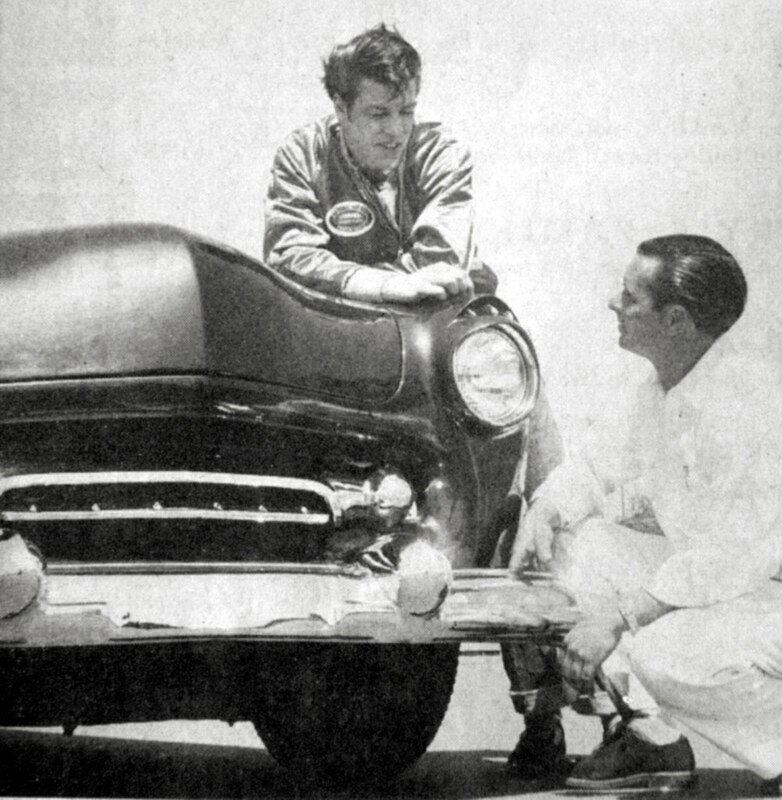 1956 was a very good year for the publicity of Don Robert’s Bear’s Custom Body Shop and Bob Dofflow’s 1949 Ford. Two very nice color photos were used on the covers. 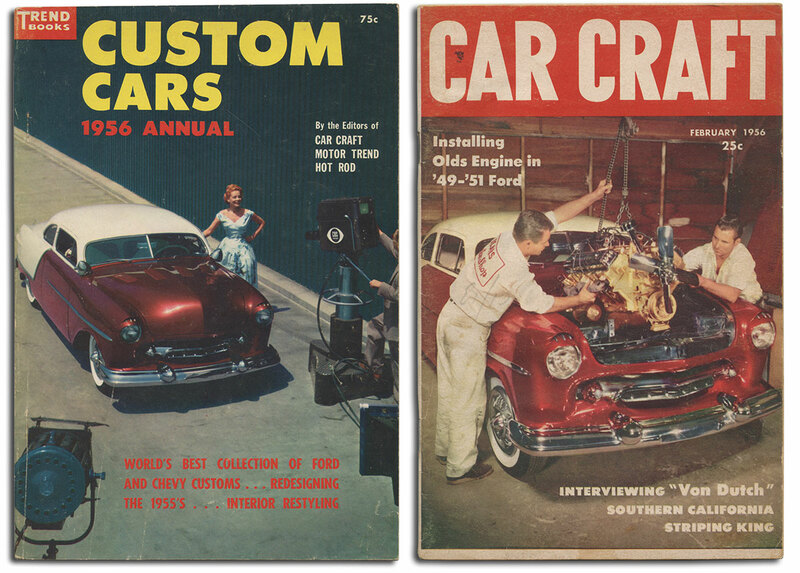 One on the ’56 Custom Cars Annual, the other on the Car Craft Feb, 1956 issue. 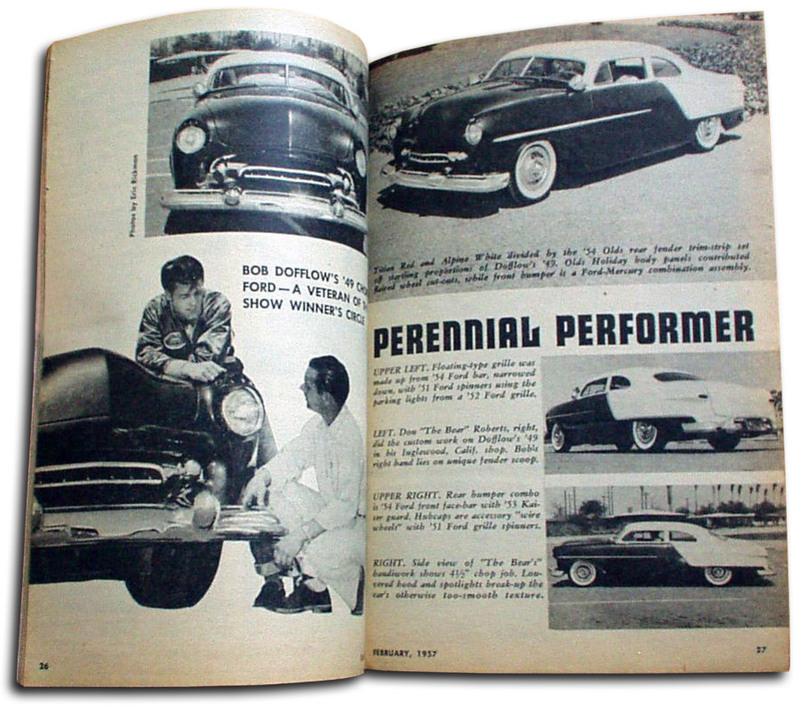 2 page feature article in the Trend Books 1956 Custom Cars Annual, which had the beautiful color photo of Bob’s Ford on the cover. Car Craft February 1956 4 page article on the engine swap in Don’s Ford. Car Craft February 1957 feature on Bob Dofflow 1949 Ford. Bob’s son mentioned that his father had owned the car up till 1962, and during those years the car was repainted in Sapphire Blue and White. This is how it looked when Bob Dofflow sold the car to somebody in Fountain Valley. 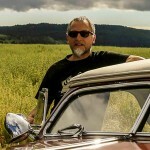 According to Dennis Heapy‬ Dave Levig from Brainerd, Minnesota bought the car in the late 1960’s in California. 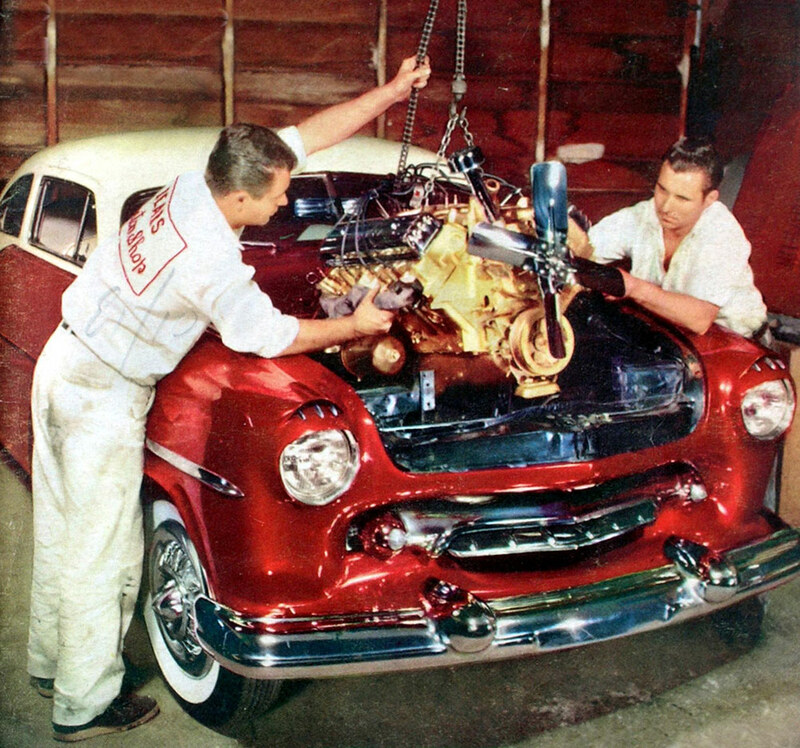 When he bought the car the Oldsmobile Rocket engine had been removed, and Dave flat towed the car back to MN. But somehow Dave’s original plans for the car changed and as far as Dennis knows no work was ever done on the car, it just sat outside the house for years. And it was just two block from where Dennis had rented a house, he saw all the time when he drove bay. And then one day in 1970 the car was gone. He asked around and found out the car was moved to Nisswa, MN. By then the car was all beat up and rolled over. Shortly after that, the car was buried in the Nisswa city dump. When Dennis heard it was taken to the Nisswa MN. Dump he drove out and sure enough there it was, back end sticking out of the junk! Such a shame… one of the best ever looking Shoebox Ford Custom gone forever. Perhaps it is time that somebody would recreate this stunning Custom, so that we all can enjoy the creative collaboration between Don robberts and Bob Dofflow that resulted in one of the most beautiful Shoebox Customs ever created. 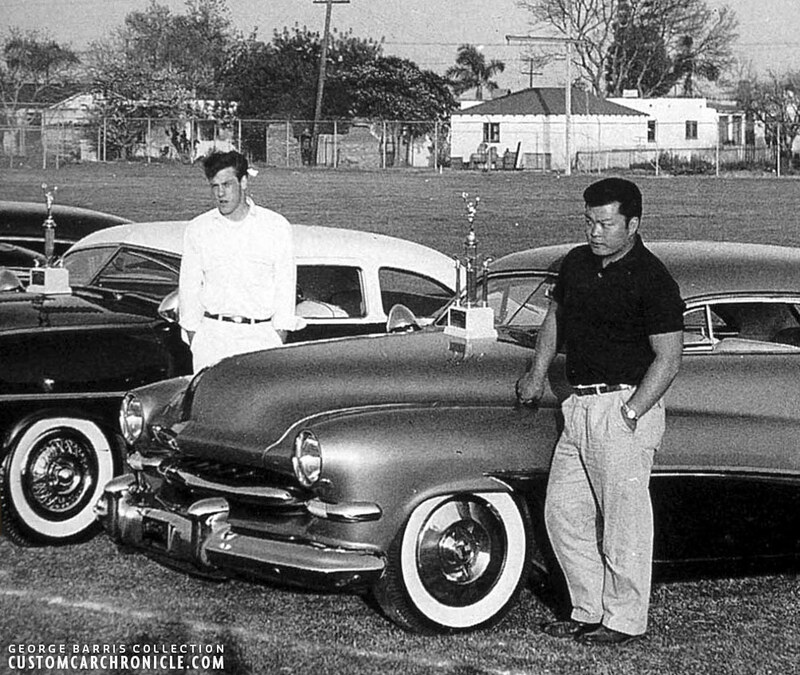 Bob Dofflow on the right and most likely Don Roberts on the left at an outdoor car show in the mid 1950’s. Captured by Ina Mae Overman. Possibly the guys are standing with Bob’s Ford, but since the yellow car on the right was the focus in the photo, there is nothing more showing in the original color slide. 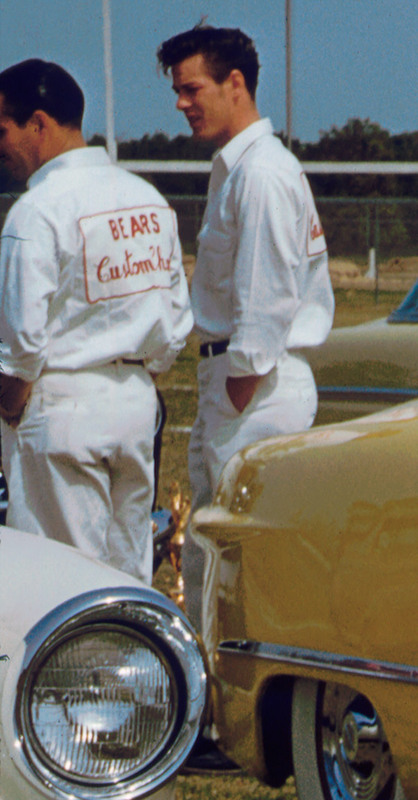 Nice to see the Bear’s Custom Body Shop employees always wear their white work and show clothes. 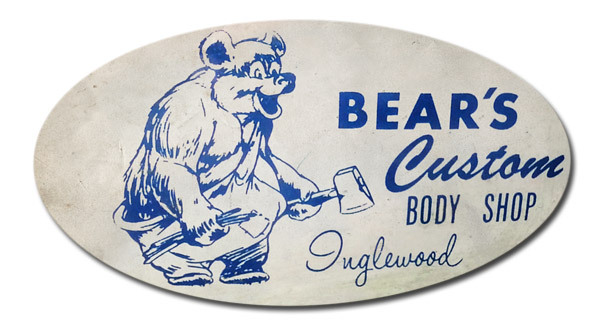 Bear’s Custom Body Shop was operated first from Downey California. 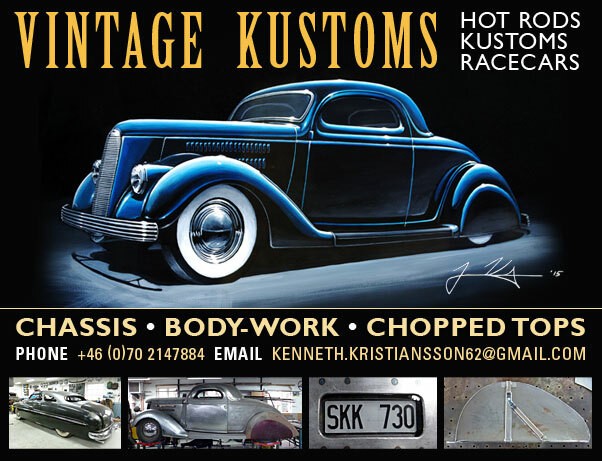 It was at this shop Don Robert and his team restyled Bob’s 1949 Ford into the show winning Custom. In the mid 1950’s the hop moved to Inglewood, California. Don later went on to work for a Chevrolet dealership in the area. 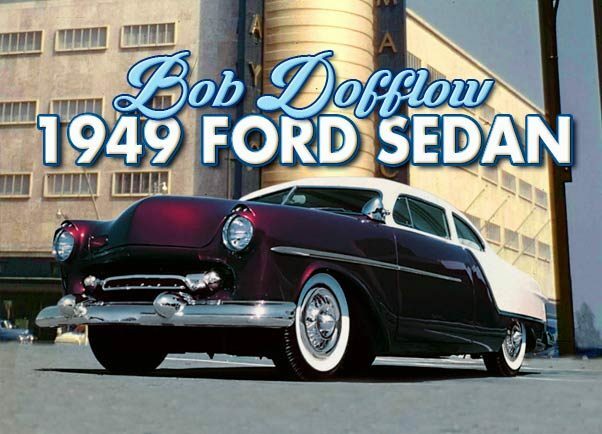 As always we are still looking for more information, and especially more photos of the Bob Dofflow’s 1949 Ford. Despite the car being one of the very best Shoebox Customs ever created, and it was a magazine cover car twice, there are surprisingly few photos from the car. If you know about more photos of Bob’s Ford, in its original maroon and white version, or the later Sapphire Blue and White version, please Email rik here at the Custom Car Chronicle, so that we can add it to this story. Thanks for the memories, Rik. Brings back Titian Red dreams. Really drooled over that car. I, too, hope a clone is in the future, somewhere.